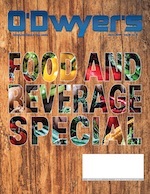 Our annual issue on food and beverage PR features articles from leading thought leaders in the field, plus profiles of 35 firms with expertise in this specialty. O'Dwyer's magazine is in its 33rd year. Contact magazine editor Jon Gingerich, jon@odwyerpr.com, for info on any of our upcoming issues.